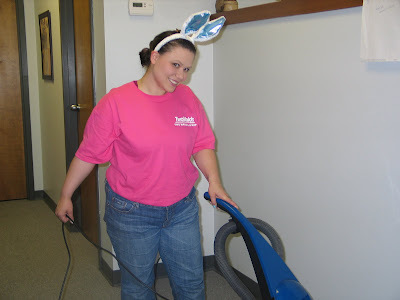 One of our awesome employees in Panama City decided to put on the rabbit ears and pose as our very own version of the Easter Bunny!! Vallerie has worked with our company for several months and we've yet to find one thing wrong with her!! All of her co-workers love working with her and all of her customers love her work ethic and personality. We only hire smiling faces and Vallerie proves that point and then some..... Thanks Vallerie! !